You know that feeling when you’ve got perfectly great recipes for a variety of different things? Your standbys, favorites. Recipes you’ve made so many times you could make them in your sleep? My list consists of thick and chewy cookies, homemade pizza dough, Panera’s stovetop mac and cheese, and maple dijon vinaigrette, among a bunch of other recipes, including these cream biscuits. The problem with those cream biscuits is that I don’t always have heavy cream on hand. And when the biscuit urge strikes (and it does happen! ), I don’t always feel like running to the store for one ingredient. 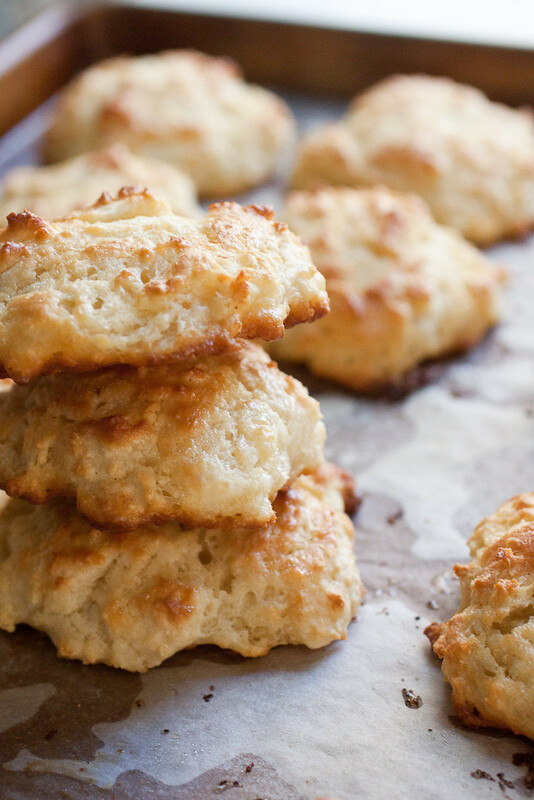 That’s where these buttermilk drop biscuits come in! I almost always have buttermilk in the fridge! And if I’m out of buttermilk, it takes seconds to whip up a simple mix of milk and lemon juice (or vinegar) to make my own. In any event, I died over these buttermilk drop biscuits. Not only do they take less time to mix together and drop on a baking sheet than it takes to wrangle a can of supermarket biscuits open, but the craggy edges and pockets of butter inside the fluffy biscuits nearly sent me over the edge. Both of the times I’ve made them, we’ve topped them with our favorite sausage gravy. But I’m confident they would be fantastic as the vessel for a spinach, feta, and sundried tomato egg sandwich, with a bowl of broccoli cheddar soup, or in a warm, napkin-lined basket on your holiday table. If you don’t have buttermilk on hand, mix 1 tablespoon of lemon juice or white vinegar into 1 cup of milk and let it thicken for a couple minutes before using in this or any recipe. Preheat oven to 450º F, position an oven rack in the of the oven, and line a baking sheet with parchment paper. Whisk the dry ingredients together in a large bowl. Cut the cold butter into the dry ingredients with a pastry cutter, two knives, or with your fingers – the butter should be the size of peas. Stir ¾ cup plus 2 tablespoons buttermilk into the dry ingredients with a silicone spatula until the ingredients just come together. If the dough is too dry to drop with a spoon onto the baking sheet, stir in 2 additional tablespoons of buttermilk. Using a large spoon, scoop out 12 equal mounds of dough on the baking sheet. Brush the tops with the melted butter. 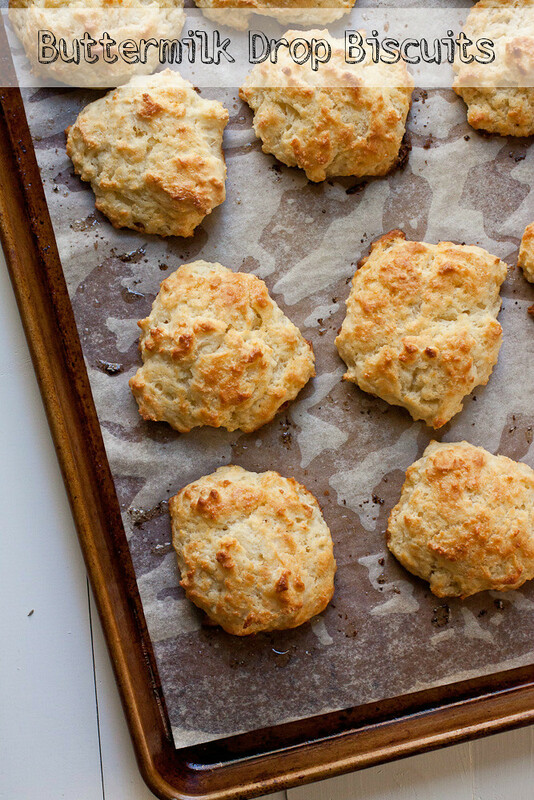 Bake for 12-15 minutes, until the tops are golden brown and the biscuits bounce back slightly when pressed. Serve immediately. To make ahead, the unbaked biscuit dough can be tightly covered with plastic wrap on the baking sheet and refrigerated for up to 2 hours. Bake directly from the fridge. Are these the same ones you added sausage and cheese to? I’m still dying to make them too! Yay! And so easy, right? 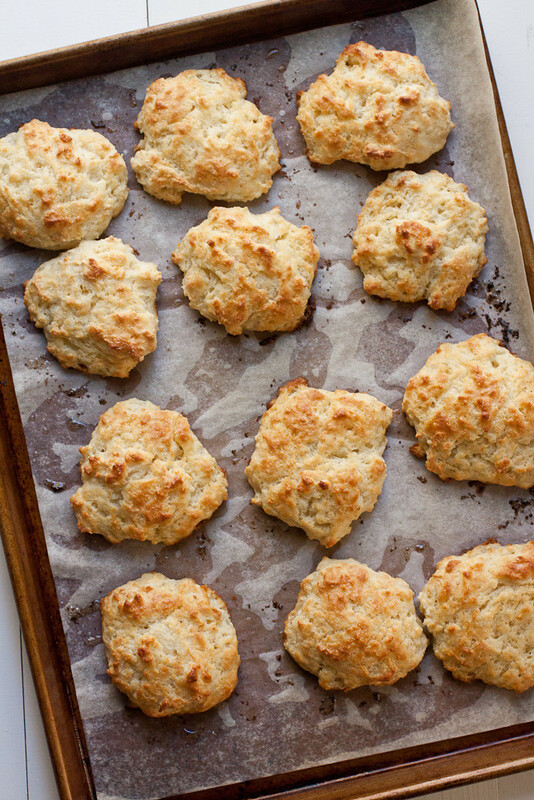 biscuits are just so simple, so delicious, so comforting! I think I’m due for a batch right about now-and these look like just the thing! Is there ever a time when one isn’t due for a batch of biscuits? 😉 Let me know how they turn out for you, Kayle!